Bernadine, your work is so unique. How do you describe it? 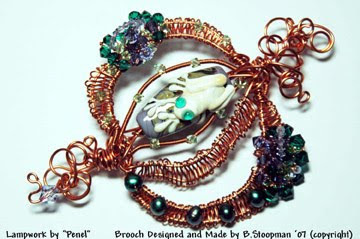 Inventive and inspired are probably the first words that come to mind when describing my wirework. Sometimes I pull bits and pieces out of my storage boxes to see what goes together but that’s not always successful for me as I don’t have an unlimited collection, so I leave it for a couple of days and surf the net for interesting beads and components or go to a trade show if there’s one on and from there I’ll pull the design together. I sometimes design on paper for customers who’d like a couple of different options, but mostly I’m given a few descriptive words such as, Black, Crystal and Glitzy and left to my own devices. Many of my designs just kind of evolve as I go along. I like to listen to music whilst working, usually just the classical radio station. Some of the pieces I’ve created, e.g. 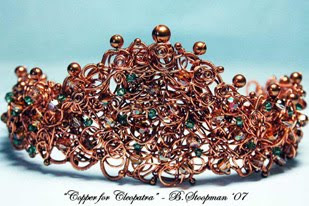 my free form wedding Tiaras, take several days to complete, sometimes I have to put them aside and work on other things as wrapping 26g wire for a couple of hours at a time is painful on the fingers particularly in winter. 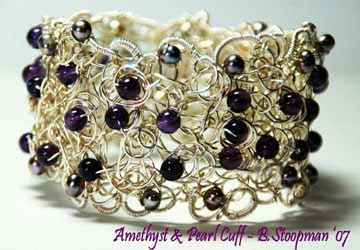 I have no formal training in jewellery design, I did study art in high school though. I’ve been creative from a very early age, painting and drawing, sewing, mosaics, and later on Photography when I did a short course. Above all I love colour, texture, and shape. I also spent 26 years or so working in corporate environments in Office Management and Finance. During that time I project managed several commerical office renovations where I got to play with colour and reasonably big budgets among other things. In Sept 2005, the International Mining and Resources company I worked for decided to relocate its divisional office from the East coast to the West coast of Australia. I walked away with a large redunancy and thoughts of a nice holiday and a new start . In March 2006, I went along to a basic stringing class just for the fun of it and was instantly hooked. From there I started making earrings, (basic techniques learnt from a book) and then really got hooked on Wire. (that could be a good title for a book…lol) The more I played around with it, the more I discovered that there’s not much you can’t make out of wire. In Nov 2006 I hosted my first jewellery viewing, with 50 or 60 people attending and did fantastically sales wise as well as collecting some wonderful repeat customers. I got alot of practice making a couple hundred pieces of jewellery for that party, as well as using my artistic skills and photographs (taken in Tasmania on that holiday I mentioned) to create swing tags and a website or two. That’s a really easy question… Wire. Playing with wire is my passion and I’d be lost without it. I’m inspired by Nature. I adore Frogs, Geckos, Lizards, Rainforests, The Beach and Ocean and all that it holds. 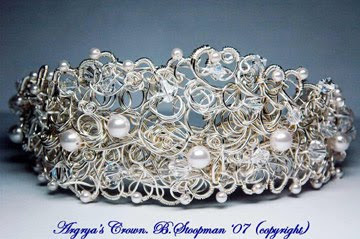 Many of these things can be seen in my jewellery creations. My will to succeed and knowing that if I give up, I’ve let it beat me. Read, Read, Read….as much as you can get your hands on. 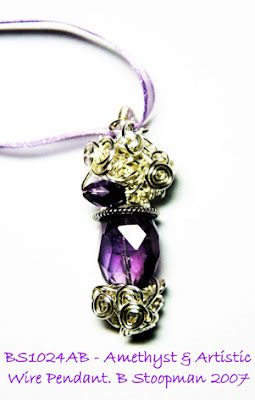 Most techniques can be learnt from books so join a Library, join a Beading Forum or group, enter as many competitions as you can afford. Experiment with new techinques, make things up as you go along, who knows what you might stumble on. 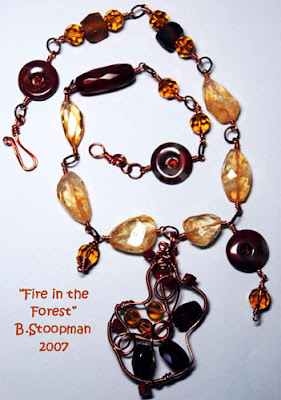 Submit photos of your work to Beading magazines, get printed. One or two might ask you to write projects for their publication. Worked for me. My beautiful Border Collie Pup – Bojak Mister Remarkable or Remy as he’s known and oh yes that dreaded housework. Love Italian Food… My mum’s parents came to Australia from the Province of Brescia – Lombardy in Northern Italy. That might have something to do with it. What’s your favorite color and other favorite things? That’s a truly difficult question for me to answer. Love colour of any tone or description generally. But to say I’m not overly keen on Yellow. Its a difficult colour for most people to wear. My other Hobbies are Photography, Gardening – I grow orchids, Painting with Acrylics and Cooking.